This compact itinerary incorporates the main highlights of the Canadian Rockies in a memorable week’s adventure. Travel on the renowned Rocky Mountaineer train and drive along the awe-inspiring Icefields Parkway, often said to be one of the most scenic drives in the world. The Rocky Mountaineer offers a world-renowned rail journey between Vancouver and Jasper, travelling through some of Canada’s most spectacular mountain scenery. The 2-day journey includes an overnight stay in a hotel in Kamloops, before continuing on to Jasper in the heart of the national park where you will collect your rental car. Your itinerary includes a full day at leisure in both Jasper and Banff, allowing plenty of time to enjoy Canada’s landscapes, culture and wildlife. 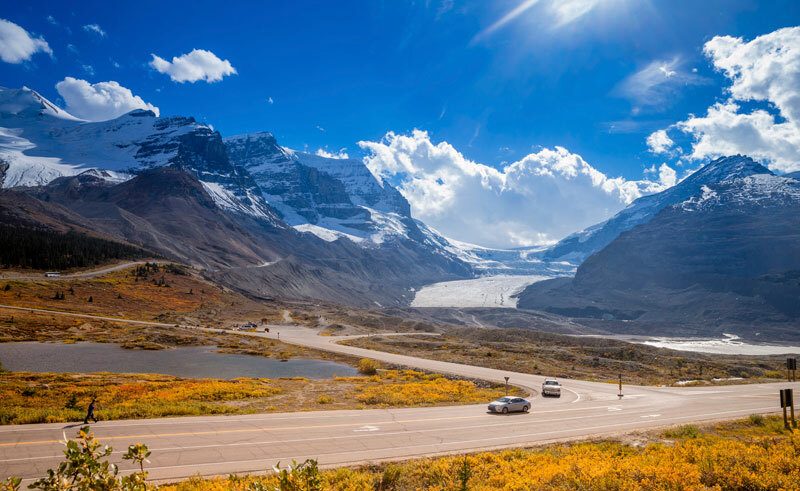 Drive the Icefields Parkway via Lake Louise and enjoy an included excursion onto the Columbia Icefield; relax in Banff’s Upper Hot Springs and enjoy magnificent views from the top of Sulphur Mountain. Board the Rocky Mountaineer train at Vancouver's Pacific Central Station. Pass through the rich fields of the Fraser River Valley and the towering peaks of the Coastal Mountains before entering the Fraser Canyon. Follow the Thompson River through spectacular landscapes to historic Kamloops, gateway to the interior of British Columbia. Breakfast and lunch included. Back on board the Rocky Mountaineer follow the Thompson River through rolling plateaus to the snowy peaks of the Monashee Mountains. View Pyramid Falls and the expansive glaciers of the Albreda Icefields. Pass by Mount Robson, at 3954 metres (12,972 feet), which is the highest peak in the Canadian Rockies. Upon arrival into Jasper you will be transferred by taxi to your hotel. Breakfast and lunch included. This morning collect your rental vehicle. Explore this charming mountain village close to many terrific scenic highlights. Take a tram ride up Whistlers mountain, or visit Maligne Lake, one of the most photographed lakes in the world, and enjoy a 90 minute cruise heading toward the south end of this postcard setting (Maligne Lake cruise not included). You will marvel at the magnificent shoreline with dense forest and glacial peaks rising abruptly from the water’s edge. Stopping at Spirit Island, you will have the opportunity to take your own version of the world famous photograph of the lake. This morning depart on the scenic drive that takes you through the spine of the Canadian Rockies. You view a never-ending procession of mammoth mountains, jagged peaks, over one hundred glaciers and pristine emerald-coloured lakes. 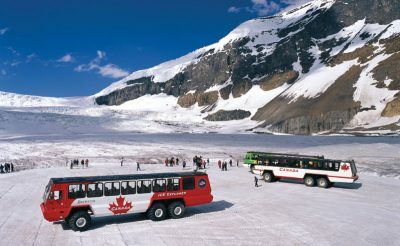 Along the way see famous sights such as the Columbia Icefield, where you can take a snocoach ride out onto the glacier itself (included). 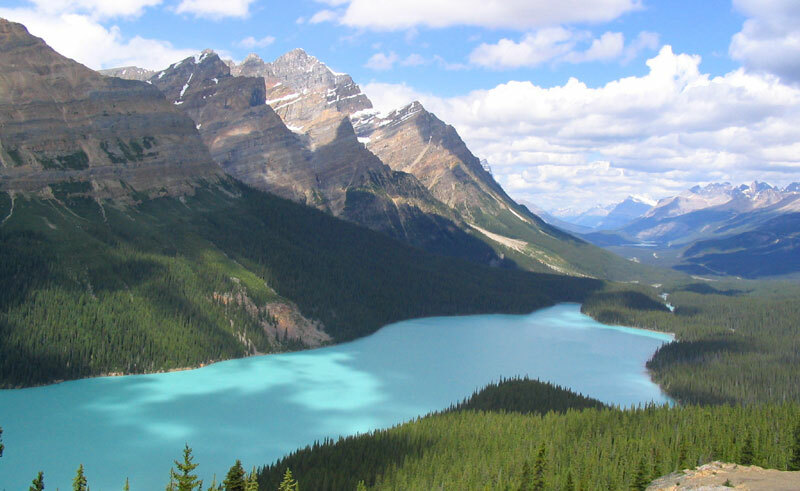 Also watch for the Sarbach Glacier, Peyto Lake, Bow Lake, with the Bow Glacier providing the backdrop, and Crowfoot Glacier before your arrival into Lake Louise. (Please note: Mountain lakes in this region will be frozen through to mid June). 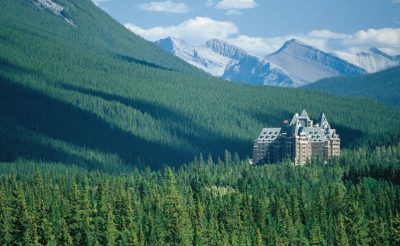 Take the short drive from Lake Louise to Banff today, travelling along the Bow Valley Parkway. This runs beside the Bow River with an option for you to take a stop at Johnston Canyon and walk along the paved footway to either the lower or upper waterfalls before continuing to Banff. A full day at leisure to explore Banff and the surrounding area. 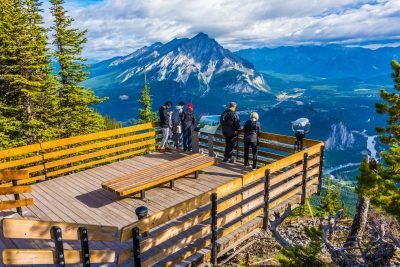 Check out the Cave & Basin National Historic Site (not included) and the Banff Gondola (included) where you will see a panoramic view of the Bow Valley, and then take a dip in the natural mineral pools at the Upper Hot Springs (included). Drive to Calgary today, along the 1A Highway. En route, you may wish to stop at the historic Cochrane Ranch before dropping off your rental car at the Calgary International Airport or downtown depot. 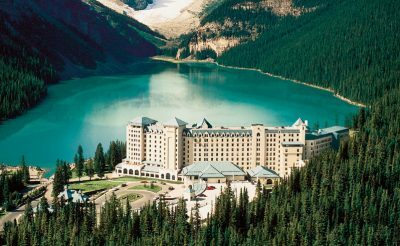 Located within Banff National Park on the shores of beautiful Lake Louise, the 550 room Fairmont Chateau is one of Canada's most iconic hotels. 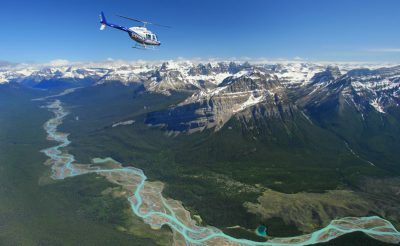 The best way to appreciate the majestic scale and untouched beauty of the Canadian Rockies is from the air.